The Ritual of Ayurveda Balancing Collection Gift Set from Rituals is the perfect present for a friend or family member or for treating yourself! Achieve inner harmony with these soothing and aromatic products based on Indian Rose and Sweet Almond Oil. Give the gift box a second lease of life by keeping photographs, letters, or other items in it. Unique shower foam technology based on Indian Rose and Sweet Almond Oil. Squeeze a small amount of gel into your hand – contact with water instantly transforms the gel into a rich, relaxing foam. 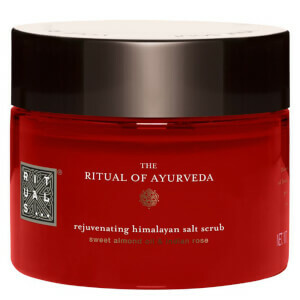 A purifying body scrub that contains ancient crystal salt from the Himalayas, which has a purifying and harmonising effect for inner balance and vitality. 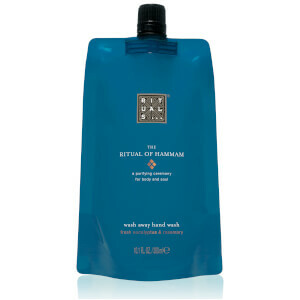 Enriched with the delightful aroma of Indian Rose and the soothing effects of Sweet Almond Oil. A mini variant of our current The Ritual of Ayurveda fragrance sticks, specially created for small rooms in your house. A natural and stylish way to fragrance your home. Fragrance Sticks: Arrange the elegant, natural sticks in the perfume-filled bottle. This is a formula in which it is not necessary to turn the sticks. If you want to have an extra perfume experience turn the sticks as needed, after this wash your hands with water and soap. Note: if you turn the sticks a lot it is possible that they last shorter than 3 weeks. Shower Foam: Aqua/Water, Sodium Laureth Sulfate, Cocamidopropyl Betaine, Isopentane, Sorbitol, Isopropyl Palmitate, Parfum/Fragrance, Isobutane, Peg-120 Methyl Glucose Dioleate, Sodium Chloride, Sodium Benzoate, Peg-40 Hydrogenated Castor Oil, Citric Acid, Guar Hydroxypropyltrimonium Chloride, Prunus Amygdalus Dulcis (Sweet Almond) Oil, Rosa Damascena Flower Oil, Hexyl Cinnamal, Limonene, Linalool, Coumarin, Butylphenyl Methylpropional, Citronellol, Benzyl Benzoate. Fragrance Sticks: Cis-4-Tert-Butylcyclohexyl Acetate, Citronellol, Tetramethyl Acetyloctahydronaphthalenes, Geraniol, Alpha-Isomethyl Ionone, Geranyl Acetate, Nerol.